Happy Birthday! 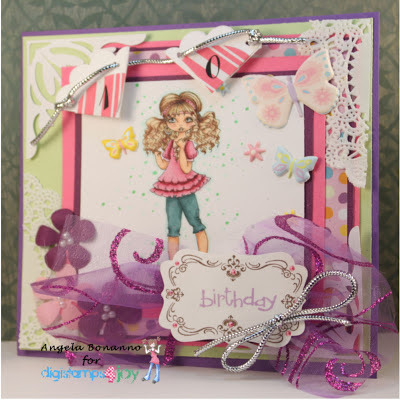 Birthdays are so much fun at Digistamps For Joy! Check out my card above using the digi image drawn by Jen Leeflang called Sharon. Our wonderful talented artist Margaret Keiser will have been the new owner of DS4J for one whole year on the 23rd February 2013, so we are having a birthday bash. Your creation/card can be anything to do with BIRTHDAYS!!! It can be for ANY age as well! 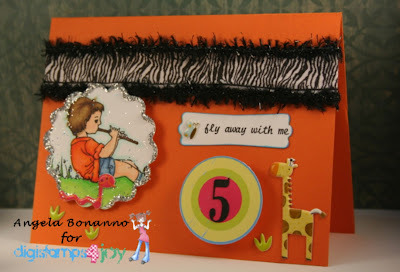 So come share your BIRTHDAY creations with us in the challenge at Digistamps4Joy! Here's my submission using this adorable digi image from Digistamps4Joy called My New Specs by Jen Leeflang this image reminds me so much of my daughter. I made the card as a valentine after the fact using this image thinking of how she had her first valentine ever. She's 18, and it was just such cute fun seeing her light up getting silly valentine gift together and making the day into something special for them both! I wish I had this card made up for her to give to him, it is such a cute image! This one is from Jen called "My new specs"
Using a couple of crafty punches, tooth picks, along with heart shaped sprinkles I was able to decorate these delicious cupcakes into a Valentine theme! Here it is my first attempt at January's 12 inch Granny square for the 2013 CAL or Crochet A long at Ravelry.com! I thought since I have those special moments in life that I just want to chill on the couch and take my mind off of things that crocheting seems to work really well for me. During those times the family really wants your presence for a movie night, I take some crochet to occupy myself. While hubby almost always falls asleep during the movie I get some projects finished or learn some new crochet techniques. I really thought doing the squares couldn't hurt, for the life of me cannot get any crochet projects to turn out square when needed and I always brush it off and say, "oh well it's handmade!" One of these days I will give my projects away and I may change my thoughts on it all. But for now we will see if I can hang with the Hookers, crochet hooking women that is... and see if I make it through 2013 with 12 new squares to turn into a blanket by next January! In the land of make believe, this is square. Alright, so I decided to join in the fun at Ravelry for their 2013 Crochet A Long of crochet blocks. I am the worst for crocheting anything that needs to be square. This square isn't even finished and it is already not square. Somehow I managed to get a few extra stitches or something. I keep telling myself I am not going to give up. I think it may have something to do with distractions. I work good if the family is doing their own thing. As soon as they need me for something and if I am in middle of crocheting... EEEK! That is why most of this square looks pretty good till the end. I am going to attempt another one I seem to always do better on my second run, as long as I don't give up after the first attempt. How about some boot scootin' boogie with these adorable Crochet Baby Cowboy/Cowgirl Boots! I found among the many, many photocopied patterns and books that my mother had in her stash, the pattern for these adorable boots! The pattern is originally from Annie's Attic 1979/1980 Baby Bootie Boutique- Cowboy Boots. I had to make it a day project since I have so many great nieces and nephews that I could be making items for. If they lived closer than 800 miles it would help but while I crochet I think of them. Some times, however rare it is; I will send a finished project to them. Before the decorative trim on side. My favorite color choice of yarn in the coaster in white. I used up a small ball of scrap white yarn and it proved to be just enough for one coaster. I was feeling a little under the weather on my mother's birthday and didin't celebrate it like I had wished. In memory of my mother, and the cup I gave her for a Mother's Day gift one year for her Hot Tea, I crocheted a coaster for carrying around that hot cup and it also helps keep the spills onto the yarn and not on your furniture. I will use the crochet skills she gave me and enjoy the hot beverage of my choice in her cup as I reflect on the memories I have. Love is in the air at Digistamps For Joy! For two weeks you have a chance to enter the super fun challenge and win fabulous prizes! Check it out! For my card I used Jen Leeflang's image of her Pin Up Dear Valentine. Happy Blogiversary to me ..
and you can win a FABULOUS Prize from Oozak!!! It is New Release Sunday at Digistamps For Joy! I used the new image Musician on a Hill. Very cute image for that perfect musical card. Want to check out more of the new images click HERE!